Home Companies Beyond Biopharma Co.,Ltd. Storage Store in a cool, dry place and keep away from direct strong light. Beyond Biopharma supplies Curcumin Powder of 95% content of Curcuminoid. Our manufacturer of Curcumin is a specialized manufacturer of this product for many years. We not only control the purity of curcumin, but also control the impurities including heavy metals and microorganism. Our manufacturer of Curcumin strictly control the purity of curcuminoid, as well as the impurities such as heavy metals and Microorganism. We gurantee that the curcumin we supply to our customers are totally safe for consumption. Curcumin has long been used as a natural pigment in the food industry. It is stable to reducing agents, has strong tinting strength, is not fading, but is sensitive to light, heat and iron ions. Mainly used for dyeing cans, sausage products, and sauces. Curcumin also has important economic value and a wide range of pharmacological effects, such as hypolipidemic, anti-oxidant, anti-inflammatory, anti-atherosclerosis. The daily dosage of curcumin is recommended to be 0 to 3 mg per kilogram of body weight. Under safety considerations, it is recommended that the daily intake should be within 200mg to avoid excessive intake. Curcumin is fat-soluble. Cooking with fats will increase the absorption rate. When eaten with black pepper, piperine can also increase the absorption rate of curcumin. 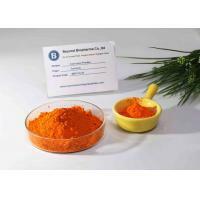 Why choose Curcumin Powder Supplied by Beyond Biopharma ? Beside the purity of curcumin, the heavy metal control and microorganism control is very critial to the quality of curcumin. we not only control the total content of curcuminoid, but also control the impurity such as heavy metals and microorganism. 1. Control Limit on the heavy metals and Microorganism: we strictly control the heavy metals and the microorganism in our curcumin powder, to ensure the safety consumption. 2. Our manufacturer is ISO22000 Verified. 4. Our curcumin is in full compliance with USP40 standard. 5.Our manufacturer of Curcumin is a specilized manufacturer of curcumin for many years. Our usual packing is 25KG Curcumin powder put into a PE bag, then the PE bag is put into a fiber drum with a locker. Then 27 drums are palleted onto one pallet, and one 20 feet container is able to load around 800 drums that is 8000KG if palleted and 10000KGS if not palleted. We are able to ship the goods both by air and by sea. We have the safety transporation certificate for both ways of shipment. A free sample of around 100 grams could be provided for your testing purposes. Please contact us to request a sample or quotation. We will send the samples via DHL. If you have a DHL account, you are very welcome to provide us with your DHL account. We have professional knowledgeable sales team which provides fast and accurate response to your inquiries.